A. The Catechism of the Catholic Church serves as a handy summary of the church’s basic teachings. True, there are 2,865 “sections” (each of them normally a single paragraph). I do, as you state, frequently quote the catechism as a handy way of responding to readers’ queries. I have referenced the catechism in response to questions as diverse as the morality of artificial insemination and whether blessed articles can be resold. He did not say that this was all you needed to know. Finally, as to whether everything Catholics do is “covered by a rule,” the answer is absolutely not. It would be far easier if that were so, if we could simply turn to a page in a book for clear-cut answers to every challenge of daily living. Most of our moral issues are complex: how to be a good parent, how to get along with people at work, how to use to the fullest the talents God has given us. On these things, a manual of behavior doesn’t always help, only daily reflection, guided by prayer. So the answer to your question is a clear “yes.” It can be beneficial to listen to preachers of other faiths and to take value from what they say. In my experience, Protestant pastors often devote more time each week to the preparation of their Sunday sermon than Catholic priests. This is due, in part, to the reality that Catholic parishes are generally far larger, with more pastoral demands on the priest’s time. But it’s also due to the fact that the sermon is the center of many Protestant services while the focus in the Catholic Church is always on celebrating the Eucharist, which was the particular way Jesus asked his followers to keep his memory alive. 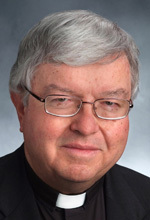 Pope Francis, though, in his November 2013 pastoral exhortation “Evangelii Gaudium,” urged priests to give increased attention to the quality of their homilies. PREVIOUS: What to do when a woman falls for a priest?